Welcome to the #1 most Upvoted, one and only Creatureless Yennett, Cryptic Sovereign deck on Tapped/Out! Yennett, Cryptic Sovereign is an interesting commander that is all about playing odd CMC spells for FREE! After all, cheating huge and mighty Eldrazis into play is like a dream come true for many of us, right? However, the unorthodox side of me just wants to take the "oddness" of the deck to a whole new level by taking the path less traveled - Going CREATURELESS! On attack, Yennett, Cryptic Sovereign allows us to cast the top card of our library for FREE as long as card's CMC is odd. While she is not the most popular "Top Deck Matters" commander out there, she is certainly the "oddest" and I like the flavor that she brings to the deck. Aminatou, the Fateshifter - Aminatou allows us to manipulate the top of our library with her +1 ability but doesn't quite let us cast the spells for free. Most Aminatou decks are built around "Blink" theme instead. Intet, the Dreamer - Intet is an interesting and fun Commander to build around. The need to deal combat damage does make the free cast trigger more challenging to achieve as compared to Yennett's. However, the versatility to cast any exiled card (face down) for free will keep our opponents in suspense and the element of surprise can be used to our great advantage. Click here to check out an awesome Intet, the Dreamer deck created by hkhssweiss. Jeleva, Nephalia's Scourge - Similar to Yennett, the free cast triggers on attack but is only limited to Instants and Sorcery that were exiled by Jeleva's ETB ability. The ability to exile cards from opponents' library as well adds to the fun as you never know what goodies we'll get to unveil. Narset, Enlightened Master - Another popular commander that, on attack, allow us to cast noncreature spells exiled this by Narset for free. Hexproof makes Narset extremely difficult to deal with. Yennett, Jeleva and Narset all allow us to cast spells for free on attack. Jeleva (instant and sorcery) and Narset (noncreature) dig deeper while Yennett (odd CMC) only looks at the top card. However, Jeleva and Narset both exile the cards they reveal while Yennett lets us have the option of drawing the revealed card should we chose not to cast it for free. 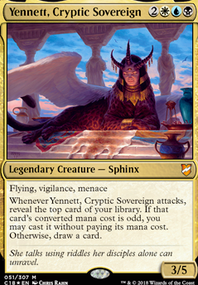 1) Yennett, Cryptic Sovereign is a relatively new Commander and grants me greater creative space to build innovative decks around her. 2) The cards that were cast for free, goes to the graveyard instead of exile, allowing us to recur them to the top of the library (e.g. using Not Forgotten ). Wincon - The key cards/enablers that help us win games. Ramp - List of Mana Rocks in the deck. I'm running 13 of them to ensure we can drop Yennett as early as possible. Top of Library Manipulation - The Heart and Soul of the deck, manipulating key cards to the top of the library to be cast for free! Protection - Grants Yennett additional protection. Lands - Fuels our march to victory! With a generous dose of quirkiness, eccentricity and the desire for fun, I present to you my We Love Freebies-Yennett Creatureless Spellslinger deck! In line with the central theme of the deck, I've assembled some unconventional combos that'll lead us to victory while leaving all our opponents flabbergasted, or those who are as weird as us... drowned in laughter at the way they lost the game. The deck can consistently combo off between turns 5-8, with a decent draw and no disruptions. I've casted Yennett, Cryptic Sovereign on Turn 2 followed by a Turn 3 Expropriate to win the game (opponents scooped after losing one of their lands to "money" and seeing me taking an extra turn with "time")! Using Proteus Staff , tuck your commander into the bottom of the library. Proteus Staff will cough out your commander as it is the only creature in the library. Proceed to rearrange the entire library, leaving sufficient non-land cards at the top to take down an opponent with a single blast of Goblin Charbelcher . Power up the cannon and fire away...while letting out a hysterical laughter! Tutor up Approach of the Second Sun to top of library. If we unfortunately drew the card early game, the deck offers several ways for us to return Approach of the Second Sun to the top of the library (e.g. Penance , Brainstorm ). Attack with Yennett, Cryptic Sovereign and play Approach of the Second Sun for free... WOOHOO! Using our card draws and tutors to get Approach of the Second Sun and cast it from our hand for the win. It's me...It's me again...It's me yet again...Still me! Imprint Mystical Tutor onto Isochron Scepter . 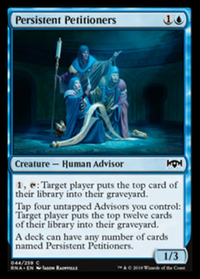 Pay to tutor Nexus of Fate to the top of the library. Attack with Yennett, Cryptic Sovereign to take a free extra turn. It's worthwhile to note that Proteus Staff can be used as a tutor for both the Approach of the Second Sun and Nexus of Fate combos. Simply send Yennett, Cryptic Sovereign on a roller coaster ride through your library then rearrange the library to complete the combo! Tutor or manipulate Approach of the Second Sun to the top of the library. Attack with Yennett, Cryptic Sovereign to cast Approach for free the first time and place the card 7th from the top of the library. Using Proteus Staff , tuck Yennett to the bottom of the library. As she's the only creature in the deck, the staff will cough her back out. Proceed to rearrange the entire library...the simplest is to put Approach of the Second Sun on top of the library. Draw Approach of the Second Sun and cast it from hand for to win the game. Tutor or manipulate Nexus of Fate to the top of the library. Attack with Yennett, Cryptic Sovereign to cast Nexus for free and shuffle it into the library. Using Proteus Staff , tuck Yennett to the bottom of the library. As she's the only creature in the deck, the staff will cough her back out. Proceed to rearrange the entire library and put Nexus of Fate as the second card from the top of the library. In your extra turn, Nexus of Fate will be the top card of the library after you've drawn a card for the turn. Go to Step #2 and rinse and repeat. You can loop Steps #2 - #4 as many times as needed to kill your opponents via Commander Damage, or draw into your other wincons like Goblin Charbelcher . Usually, my opponents just scoop it up once this loop is established. Yennett, Cryptic Sovereign welcomes you into her realm of endless wisdom. Fret not! Here're the general strategies to help you pilot the deck like the Evil Mastermind himself (i.e. Yours Truly)! Cast Yennett, Cryptic Sovereign as early as possible and protect her from harm's way so you can attack with her repeatedly. Shout "Abracadabra!" while you manipulate the top of the library. Priority should be given to Extra Turn spells and game winning cards (e.g. Approach of the Second Sun ). During those extra turns, continue tutoring for and setting up game winning combo pieces like Proteus Staff , lining yourself up for the win. This is the nut shell, pretty simple right! 2 - 3 Lands that provide , and/or . 1 - 2 Mana Rocks, especially Mana Crypt , Mana Vault , Sol Ring , Mox Diamond and/or Chrome Mox would almost guarantee a Turn 2/3 Yennett, Cryptic Sovereign ! 1 - 2 cards to manipulate the top of your library, so cards like Mystical Tutor , Vampiric Tutor or Brainstorm would be ideal. Liliana Vess is also a great card as we can use her -2 ability twice, effectively buying us 2 free turns (by tutoring for Extra Turn spells and casting them using Yennett's ability). The last slot is flexible and can change depending on meta. In a removal/counter heavy format, we would want Force of Will or Misdirection in our hand to protect Yennett. A hand with only 2 lands, 1 of which provides colorless mana only. Yennett requires to cast and the last thing we want is to be color screwed. A hand full of high CMC spells with no way to put them back on top of the library. A land-flooded hand. While we will not miss land drop for the next 5 - 6 turns, we also have no means to cast Yennett earlier than Turn 5 (unless we top deck our ramps in the 1st couple of draws). Dropping Chrome Mox or Mox Diamond (even if it means exiling/discarding a good card) to cast a mana rock on Turn 1. Tutoring for Mana Crypt , Mana Vault or Sol Ring using Demonic Tutor , Fabricate or the likes, with the aim to cast them on the same turn. This will often give us sufficient mana to cast Yennett in our next turn. A Turn 2 Fabricate is possible if we've cards like Ancient Tomb or Sol Ring in play. I'd tutor for a land or artifact land if that's what it takes to ensure I have all 3 of the Esper colors by Turn 3. If our ramping goes well, we're poised to cast Yennett, Cryptic Sovereign now. At this juncture, it'd be ideal for us to have some means of protecting her so that we get to attack with her in the next turn. Cards like Force of Will , Pact of Negation , Misdirection and Swiftfoot Boots would be perfect for the job. Manipulate the top of our library so that we can milk Yennett's attack trigger for the win! Opponents who know what's coming, would be frantically digging for answers or trying to rally the table against us in hope that someone would have an answer to stop our combo. We can be pricked by the occasional thorn among them. If Yennett gets removed or countered, look for an opportunity to recast her, leaving sufficient mana/cards to protect her thereafter. We've to be an opportunist here and play the politics right. Without Yennett on the table, our opponents would usually have their eyes on another player who is now a bigger threat. This gives us an opportunity to amass our resources, slowly and covertly setting up the stage to re-summon Yennett. Summoning Yennett, Cryptic Sovereign early can be a challenge given her casting cost. Turn 1 - Need a GOD draw to pull this off and I've only done it once. Turn 2 - This is highly possible if we've a good mix of Mana Rocks in our opening hand. Mana Vault , Mana Crypt to help provide the generic mana and Chrome Mox , Mox Diamond & the Signets to help with color fixing. I've saw Yennett hit play on Turn 2 many times. Turn 3 - This is fairly common as having at least 1-2 Mana Rocks in our opening hand and/or drawing into them in Turns 1/2 would enable this. Turn 4 - This usually happens when we only draw 1 Mana Rock (usually those that provides 1 mana when tapped) or have missed our land drops. Turn 5 onwards - Bad luck is on our side when we're unable to draw into any mana acceleration. We're most vulnerable when we're fully tapped out to summon Yennett, Cryptic Sovereign . Force of Will , Pact of Negation and Misdirection are the 3 key cards we've to protect Yennett from harm's way. Always try to save them for this purpose and resist the urge to use them in other situations unless they're life threatening or game changing. Flying and Menance makes Yennett extremely difficult to block. In a multiplayer game, chances are, there'd always be at least 1 player who is left open for us to swing into. We would want to manipulate the top of our library so that we can cast an Odd CMC spell for free. Priorities are usually given to Extra Turn Spells or game winning spells like Approach of the Second Sun , let's call them "Bombs" from hereon for the ease of reference. The best scenario is when we've these tutors in our hand at this juncture. If the tutor is an instant (e.g. Mystical Tutor , Vampiric Tutor ), I'd cast it only when Yennett's attack ability is on the stack. This would minimize the possibility of disruptions affecting our game plan (e.g. we tutor for the card we want during the pre-combat main phase, only for Yennett to be removed before combat. We'd end up drawing the tutored card in our next turn). If the tutor is a sorcery or one that can only be used at sorcery speed (e.g. Personal Tutor , Liliana Vess or Cruel Tutor ), we'd have to cast it in our pre-combat main phase. If we unfortunately draw the Bombs, we've Penance , Conch Horn , Brainstorm , Dream Cache and Scroll Rack at our disposal to return them to the top of our library. 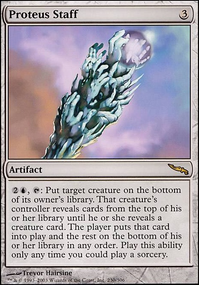 If we don't have tutors in our hands, cards in this category allow us dig into the top few cards of our library, hoping to unearth a Bomb from among them - Crystal Ball , Dimir Machinations , Ponder , Sensei's Divining Top or even Condescend . Fetch Lands comes in handy to refresh the top of our library by shuffling away the useless cards, so don't be too eager to crack them when you already have sufficient mana at your disposal. Not Forgotten recurs a card from graveyard to the top of the library. I'd usually tutor for Extra Turn spells that do not get exiled after use when I've this card in my hand. This would set me up for another Extra Turn. Taking a few extra turns doesn't win us the game. They merely buys us more time to grow our resources and dig for the combo pieces we need. When I'm able to tutor cards to the top of my library, I'd usually fetch Expropriate first as it also allows us to take a permanent from each opponent (they will usually chose "money"). Taking the lands/mana rocks from them actually ramps us for the extra turn ahead! Depending on our draw and resources available, we'll have to decide which line of victory we're pursuing at this point. We can take "infinite turns" if we're able to repeatedly manipulate Nexus of Fate to the top of our library. Thereafter, we can kill our opponents via Commander Damage by attacking with Yennett, Cryptic Sovereign . Fret not if our opponents have ways to prevent them from taking Commander Damage (e.g. having blockers in play, or damage prevention cards like Energy Field ) or losing the game (e.g. Platinum Angel ), as the extra turns would allow us to dig for answers to these pesky cards. Winning via Proteus Staff is the easiest and I win the majority of my games this way. It is important to know when we should use the staff to tuck Yennett away. There're 2 scenarios where we can tuck Yennett away and rearrange our entire library before combat. If our opponents are unable to stop us from doing so and/or have ways to counter the free spells we can cast hereafter, then the game is ours for the taking. Swiftfoot Boots is our haste enabler and allows Yennett to attack after Proteus Staff cough her out from the library. In this scenario, we only need to decide which 2 cards we want to put on the top of our library. The 1st card would be the card we want to play for free using Yennett's attack trigger (usually an extra turn spell) and the 2nd card would be the card we want to draw in our extra turn ahead (note that we'd not be able to determine the next card we draw if we cast Nexus of Fate for free as it causes us to shuffle our library). Second card - The card I want to draw in my extra turn. I would usually grab Swiftfoot Boots unless it's in the graveyard or was exiled. If the latter is true, we can grab Isochron Scepter here. Third card - The spell I want to cast for free in my extra turn. Fourth card - I do not need to arrange the 4th card onwards if I've grabbed Swiftfoot Boots earlier. Else I can put Mystical Tutor as the 4th card, imprinting it onto the Scepter would allow me to set up the infinite turns loop. Top card - The card I want to draw next turn. My usual target would be Temporal Mastery to cast for its Miracle cost, an Extra Turn spell I can hard cast or Swiftfoot Boots . Second card - The card I want to cast for free in the next turn. Third card - I usually do not need to arrange the 3rd card onwards if I've set up the top card as mentioned above. 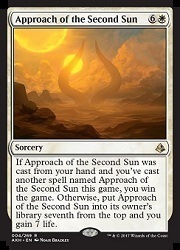 Approach of the Second Sun offers an interesting Wincon. We generally aim to cast it for free the first time (via Yennett's attack trigger) and it becomes the 7th card from the top of the library. Hereafter, it is all about quickly drawing Approach of the Second Sun again and cast it from our hand the second time to win the game. Alternatively, Approach of the Second Sun can be manipulated to the top of the library using Personal Tutor , Proteus Staff , etc. In this case, we'd need a draw spell/effect (e.g. Brainstorm , Sensei's Divining Top , Scroll Rack , etc) to draw Approach and cast it from our hand. More time to dig up Approach of the Second Sun . All in all, winning via Approach of the Second Sun combo is relatively easy and straight forward, given that the deck is packed with tutors and library manipulation tools. This section captures the salient points of interesting game plays so that readers can gain a better understanding of the way I pilot this deck. This is a difficult match-up as Lavinia can potentially jeopardize my game plans by countering all my free-to-cast spells. Turn 1: I drew a relatively good hand and was able to cast Sol Ring into Grim Monolith on Turn 1. As expected, Lavinia, Azorius Renegade hit the field on Turn 2 to try to disrupt my game plan. We also saw a Sylvan Library hit the table as the Karametra player attempts to filter through his library for answers. Yennett, Cryptic Soverign swooped onto the battlefield on Turn 3 and her attack trigger on Turn 4 revealed a Mystical Tutor which I chose to draw. I drew a Cyclonic Rift on Turn 5, just the spell I need as I devise a plan to break the Lavinia disruption. Yennett's attack trigger merely revealed a land. Turn 6 was the big turn that decided the game. At the start of Combat, a Swords to Plowshares targeting Yennett was countered by me. With Yennett's attack trigger on the stack, I casted Mystical Tutor , holding priority, I casted Cyclonic Rift targeting Lavinia. The owner had previously expended his last casting Swords to Plowshares and thus was unable to pay for Devoted Caretaker 's ability to protect Lavinia from the bounce. Mystical Tutor resolved, fetching Expropriate , which was casted for free. I took Sylvan Library from the Karametra player, Devoted Caretaker from the Lavinia player and received an "Extra Turn" from the Muldrotha player. From thereon, I was able to chain into another 3 Extra Turns ( Sylvan Library played a key role to help me filter my draws) before finding Dimir Machinations . I transmuted for Proteus Staff and played it, spinning my Mishra's Factory in so I can rearrange my entire library. Knowing what is going to happen next, my opponents scooped and congratulated me for a game well played. Yennett, Cryptic Sovereign hand-picks only the finest to join her march towards victory. This section covers the choice of cards under each "Custom Category", offering you an insight into why certain cards were picked over others. Notable cards that were excluded are also highlighted. Approach of the Second Sun - Cast the first time for free and cast the second time from hand to claim your victory. may seem expensive but we've sufficient mana rocks to support this. Goblin Charbelcher - Lock and Load... Take Aim... BLAST OFF! Classic combo piece with Proteus Staff . Isochron Scepter - Stick a Mystical Tutor or Vampiric Tutor on it and sail your way to victory by tutoring the key cards to the top of your deck turn after turn. Yennett, Cryptic Sovereign is a 5 CMC commander, so we need lots of ramp to power her out asap. With the exception of Gilded Lotus , all other rocks can be tutored by Tezzerret the Seeker, depending on the situation. Chrome Mox - Extremely useful ramp and color fixing in early late. In mid/late game, you can feed it to Reshape (Note: You can cast it without imprinting anything if the purpose is to use it to pay for Reshape's additional cost). Mana Crypt - casting cost for every turn... I'll gladly take damages anytime! Mox Diamond - Allows us to drop Yennett earlier. Mana Vault - I call this colorless "Dark Ritual" since I almost never pay to untap it after it. Can be fed to Reshape to stop the bleed. While the casting cost is Even, I run quite a number of these rocks to allow us to cast Yennett as early as possible. The fastest I can drop her was on Turn 2, thanks to an opening hand of Mana Crypt , Coalition Relic and 2 lands. Azorius Signet / Dimir Signet / Orzhov Signet - I run all 3 signets for color fixing. Grim Monolith - Helps me drop Yennett on Turn 3. I do occasionally pay to untap it at end of opponent's turn if I've the mana to spare. Talisman of Dominance / Talisman of Progress - I run both talismans too for color fixing. Chromatic Lantern - Extremely useful for color fixing in a 3 color deck. Coalition Relic - The 1 additional mana provided by the charge counter could sometimes hasten your plans by 1 turn when you're just 1 mana short. Darksteel Ingot / Commander's Sphere - They can be swapped in should you prefer the colored mana. I run almost all odd CMC Extra Turn spells in this deck. Expropriate - It'll gain you at least 1 extra turn and a bunch of free permanents. Most experienced players would give you "Money" but in the rare occasions you're given several extra turns, the game is as good as yours for the taking. Nexus of Fate - A key piece of our combo since it returns to your library after use and we've many ways to bring it up to the top. Temporal Manipulation / Time Warp - Standard extra turn spells. Temporal Mastery - There're plenty of ways manipulate this to the top of the library to benefit from its "Miracle" ability. Temporal Trespass - "Delve" may come in handy should Yennett be removed repeatedly. Capture of Jingzhou - The only odd CMC extra turn spell not in deck, solely because of its out of my budget atm. Other Even CMC Extra turn spells - Doesn't interact well with Yennett's ability. I run a lot of tutors in the deck to ensure we can consistently gather our combo pieces. These tutors synergize well with Yennett, Cryptic Sovereign . Liliana Vess - I mainly use her -2 to tutor an extra turn spell to the top of the library so Yennett can cast it for free. She'll buy us 2 turns. Lim-Dul's Vault / Mystical Tutor / Vampiric Tutor - As a rule of thumb, I'd cast these set of tutors only when Yennett's attack ability is on the stack. This would minimize the possibility of disruptions affecting our game plan (e.g. we tutor for the card we want during the pre-combat main phase, only for Yennett to be removed before combat. We'd end up drawing the tutored card in our next turn). Personal Tutor - Sorcery spell and only tutors for sorceries but still extremely useful as majority of our extra turn spells fall into this category. Cruel Tutor - Extremely useful card, from setting up my next draw to lining up extra turn spells/wincon to cast for free with Yennett's ability. Dark Petition / Demonic Tutor - Fetches basically anything we may need to cast from our hand, from Approach of the Second Sun to counter spells to protect our combo pieces. Fabricate - When drawn early game, I usually look for Mana Crypt so that I can immediately drop it as ramp. 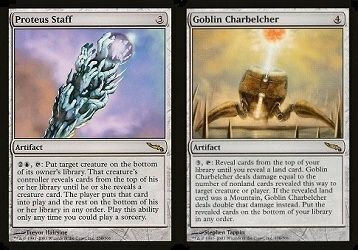 When drawn mid/late game, the prime target would either be Isochron Scepter , Proteus Staff or Goblin Charbelcher to finish off the game, depending on which line of victory we're gearing towards. Dimir Machinations - Fetches useful 3 CMC cards like Penance , Proteus Staff or Toxic Deluge . 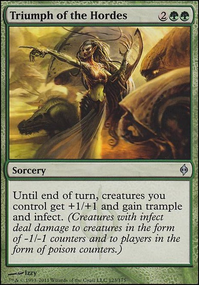 Muddle the Mixture - Fetches useful 2 CMC cards like Cyclonic Rift , Isochron Scepter , Lim-Dul's Vault or Swiftfoot Boots . A suite of tutors to fetch our key artifacts. Transmute Artifact / Whir of Invention - Accelerates our game plan by grabbing us mana rocks during early game and Proteus Staff , Isochron Scepter , etc during mid/late game. I run 3 artifact lands in the deck which can be fed to Transmute Artifact should the need arises. Tezzeret the Seeker - The card's ability to me reads " - Search your library for an artifact card with converted mana cost 4 of less and put it onto the battlefield." I'm not too worried about protecting Tezzeret after tutoring for the needed artifact. Do note that we can tutor for casting cost artifacts like Mana Crypt without removing any loyalty counter from Tezzeret! Grim Tutor / Imperial Seal - Omitted due to budgetary constraints. Enlightened Tutor - Most of our artifacts are mana rocks and we only run 1 enchantment. I don't find the need to run this at the moment as tutors in this category serve the sole purpose of allowing Yennett to cast the tutored cards for free and we really want to be casting more impactful cards this way. 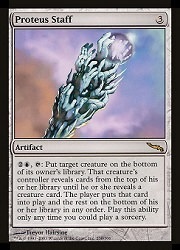 Brainstorm / Conch Horn / Dream Cache / Scroll Rack - Allow us to put the high CMC cards we drew onto the top of the library. Crystal Ball - This may seem underwhelming at first but the ability to put useless cards to the bottom of our library is awesome, especially when combined with cards like Sensei's Divining Top or Brainstorm . Dimir Machinations / Ponder / Preordain / Sensei's Divining Top - Let us rearrange the top of our library. Ponder has the added benefit of allowing us to shuffle our library when the top 3 cards ain't useful. Not Forgotten - Recurs an odd CMC card to the top of our library. Doubles up as a Token producer, allowing Proteus Staff to do its magic and let us rearrange our entire library. Penance - A hidden gem tailored made for this deck. Allows you to put back an odd CMC card to the top of the library. Do note that the Oracle Text reads - "Put a card from your hand on top of your library: The next time a black or red source of your choice would deal damage this turn, prevent that damage.". Therefore you can activate Penance to create a "protective shield" even when there's no black/red damage source at that point. If Yennett is the only black/red source in play, you'd unfortunately have to prevent her damage. Proteus Staff - Our Superstar of the deck. Being creatureless, activating the staff's ability to tuck any creature (Yennett or our man lands) to the bottom of the library will allow us to rearrange our entire library! NOTE: Crack our fetchlands only when we need the mana! Else, save them for later, as they provide a must needed "shuffle library" effect when the top few cards of our library ain't useful. Jace, the Mind Sculptor - Omitted due to budgetary constraints. Also, we've very limited ways to protect our Planeswalkers from combat damage as Yennett is our only creature in the deck. Insidious Dreams - Was in my earlier iterations of the deck but was replaced by a more powerful tutor spell. Anguished Unmaking - Deals with any permanent at instant speed. Path to Exile / Swords to Plowshares - 2 of the best instant creature removal white has to offer. "Exile" allows us to deal with troublesome Indestructible creatures. Austere Command - Even CMC but I still include it for it's versatility. Cyclonic Rift - Blue Staple. Supreme Verdict - Uncounterable board wipe ensures it gets the job done. Terminus - "Miracle" ability synergizes well with the deck. Sometimes, tucking the creatures at the bottom of the library is stronger than sending them to the graveyard (e.g. against Reanimator decks, Muldrotha, the Gravetide , etc). Toxic Deluge - One of my favourite board wipes. Yennett has a relatively high toughness of 5 so we can -4/-4 if we want to keep her alive. Indestructibles shiver at the mention of this card too! Tragic Arrogance - Odd CMC, Yennett is unaffected and you yet to cherry pick the permanents your opponents get to keep! Pure value. Esper grants us access to a plethora of removals. Which to include really depends on your personal preference and Meta. Damnation / Day of Judgment / Wrath of God , etc -I prefer more versatile board wipes or those that could deal with troublesome pesky creatures as explained above. Kindred Dominance / In Garruk's Wake / Necromantic Selection / Plague Wind and other Odd CMC high casting cost board wipes - While they offer powerful effects, they're difficult to cast from hand and we almost entirely rely on Yennett to cast them for free. More often than not, they're uncastable dead cards in my hand when I'm badly in need of a timely boardwipe. Vindicate / Utter End - Prefers Anguished Unmaking which is an Odd CMC instant with "Exile" effect. Other spot removals like Go for the Throat , Hero's Downfall , etc - Prefers "Exile" over "Destroy" effects. Arcane Denial / Counterspell / Mana Drain - Our trustworthy 2 CMC counterspells. Drain ramps us too in our next turn. Condescend - Counter and Scry effects in 1 card. Ran out of ways to manipulate the top of your library? Cast any spell during your pre-combat main phase and target the spell with Condescend with X = and you essentially paid to Scry 2! Force of Will / Pact of Negation - Extremely useful to protect our key spells when we're all tapped out. Muddle the Mixture - Cause I'm a great fan of versatile cards with multiple uses. Once again, there're plenty of other Counterspells to pick from and the amount we play in the deck, is based on personal preference and Meta. Mystic Confluence - Overpriced counterspell. While it has odd CMC, there are better options to cast for free using Yennett's ability trigger. Cryptic Command - Excluded mainly due to the in its casting cost, especially in a three color deck. Swan Song / Negate , etc - I prefer less restrictive Counterspells. Spell Pierce / Mana Leak , etc - I prefer hard counters over these. A small protection package to keep Yennett, Cryptic Sovereign safe. Misdirection - Protects our key combo pieces, especially when we're all tapped out. Swiftfoot Boots - Grants Yennett "Hexproof" and "Haste"
Maze of Ith / Reconnaissance - Yennett has Flying and Menance, making her extremely difficult to block. In a multiplayer game, chances are, there'll be at least one player whom we can swing in without putting Yennett in harm's way. Lightning Greaves - Greaves grants "Shroud" which works against our core mechanic as Proteus Staff will not be able to target Yennett when she's wearing this pair fashionista footwear from Milan. Ancient Den / Seat of the Synod / Vault of Whispers - I run all 3 Esper color artifact lands to increase the number of sacrifice targets for Reshape . Ancient Tomb - Powerful ramp, especially when drawn early game. Arid Mesa / Bloodstained Mire / Marsh Flats / Misty Rainforest / Polluted Delta / Scalding Tarn - Suite of Fetchlands for color fixing. The shuffle effect is useful to refresh the top of our library. Blinkmoth Nexus / Mishra's Factory - Manlands to provide more targets for Proteus Staff . Command Tower - Commander staple except for mono-color decks. Drowned Catacomb / Glacial Fortress / Isolated Chapel - Entire suite of Esper "Check Lands". Fetid Heath / Mystic Gate / Sunken Ruins - Entire suite of Esper "Filter Lands"
Godless Shrine / Hallowed Fountain / Watery Grave - Entire suite of Esper "Shock Lands". Inventors' Fair - Doubles up as an Artifact Tutor. Nimbus Maze - For color fixing. Underground Sea - My sole copy of ABUR Dual Lands cause this is the only copy I own. Mutavault / Inkmoth Nexus - Opted for the cheaper (monetary value) alternatives . Creeping Tar Pit / Celestial Colonnade & the other manlands - Prefer manlands with low activation cost. Choked Estuary / Port Town - Prefer the "Check Lands" over these. 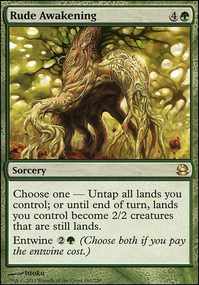 Prairie Stream / Sunken Hollow - We only run a total of 9 basic lands so chances are, they always ETB tapped. Temple of Deceit and the other Temples - While they allow us to Scry 1 when they ETB, I'm not a fan of lands that ETB tapped in general. Yennett, Cryptic Sovereign invites you to take a breather before you embark on your exploration into the realm of eternity. This is essentially the "End Step" as we wrap up the Primer. A big thank you for staying with me through this journey and thank you for your support, suggestions, comments and upvotes! Unlocked on 22/3/2019 - 10,000 Views! Big thank you to everyone who stopped by. Unlocked on 25/2/2019 - Received 100 Upvotes! Thank you everyone for your support! Unlocked on 10/2018 - #1 Most Upvoted Yennett, Cryptic Sovereign Deck on Tapped/Out. Matrixxx999 for helping me with the coding for this page. scotchtapedsleeves for addressing my endless queries and guiding me through the coding labyrinth. Daarkest for adding this into the "Featured Decks Queue" on 11 Feb 2019. My Gain is your Pain! I'm constantly brainstorming on ways to improve this deck so feel free to add your peculiar and crazy concoctions to the brew! I welcome all things wacky, bizarre and freakish into my cauldron of ideas! Achieved #1 position in Commander/EDH on 16 Mar 2019. Thank you everyone for your support and suggestions! Added a new "Chronicles of War" section to the Primer to document interesting game plays so that readers can better understand how I pilot this deck.